NGC 5139 contains many types of stars at varying stages of development. This indicates many levels of star formation occurring over a few billion years. One possible explanation for this is that NGC5139 is a captured system from another dwarf galaxy. This is supported by a retrograde motion of the cluster and all stars in the cluster have the same proper motion, rotation, and average radial velocity. Typical of most globular clusters, the Omega cluster contains blue stragglers and variable stars. In addition, there are stars along the main sequence like our own sun and red giants. This cluster has been a goal of mine for the 3 years that I have been imaging. It sits very low in the sky from 34 degrees latitude and is only visible here for about a month. I was very pleased when I slewed to the target and there was a cluster in my field of view! The only problem was that there was a pipe I use for a wind screen that ran right through the frame. The pipe is permanent and I did not want to cut it to get the shot. I think this is what caused the strange shapes of some of the brighter stars. This cluster was captured in one sitting at a dark sky site with a SQM of 20.69. The conditions were excellent with a clear sky, a temperature of 65F, and humidity at 50%. I was surprised how much was revealed with 60 second exposures. NGC 5053 is a globular cluster in the constellation Coma Berenices. NGC 5053 appears like a mix of a globular and open star cluster. It is not densely packed even in the core area so it can be easily resolved by large telescopes. A study in 2001 found that NGC 5053 contains 10 RR Lyrae variable stars. An RR Lyrae variable is a star with a pulsating variation in brightness with a cycle of .2 to 1 day. 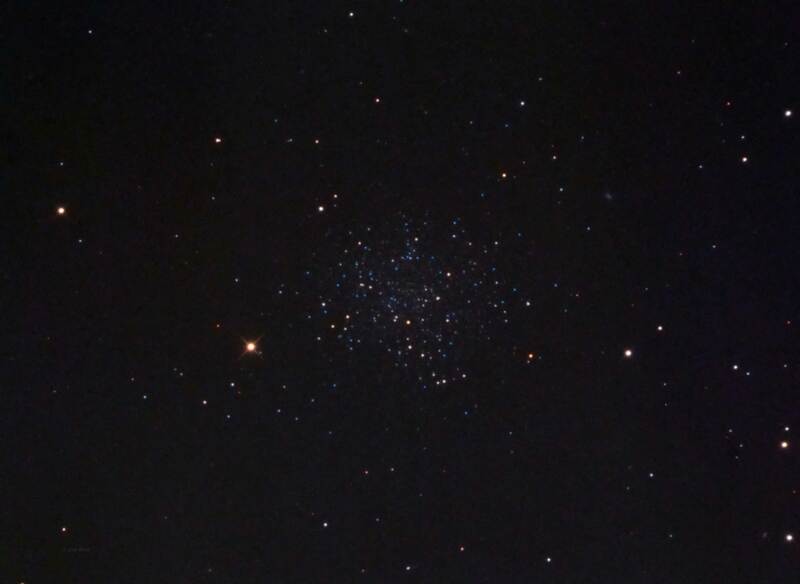 NGC 5053 also contains 28 blue stragglers at last count in 1995. A blue straggler star is thought to be the result of an interaction with another star that leaves the star stripped of its outer layers. This interaction causes the star to appear hotter than what would be possible in an old globular cluster. Another explanation is that they are binary stars in the process of merging and forming a larger hotter star. An interesting discovery was made while studying NGC 5053. It was found that the cluster was metal poor and dissimilar to other clusters in the Milky Way. One theory for this was that NGC 5053 did not originate in our galaxy but was captured by an ongoing interaction with the Sagittarius dwarf spheroidal galaxy. This makes sense given its location in the intermediate halo of our galaxy. NGC 5053 is not the only globular cluster in the Milky Way acquired from the interaction with the Sagittarius dwarf spheroidal galaxy. Some others are NGC 4147, Palomar 2, Palomar 12, and Whiting 1. This image was captured from my house in a Bortle 6 zone. It took two nights to capture this image due to the ever present marine layer that is common for May in southern California. The first night I captured all of the RGB data and the second night I was only able to capture 11 frames before the sky fogged over. Conditions were not great with humidity in the 80-90% range. NGC 4147 is a globular cluster in the constellation Coma Berenices. This is a small and compact cluster that resides in the higher latitudes of our galaxy placing it in our galactic halo. NGC 4147 is not very bright when compared to the other 146 known globular clusters in our galaxy, in fact it ranks 112th brightest out of the 146. NGC 4147 is home to several variable stars, some red giants, and also some blue stragglers. However, not a lot is known about the quantities of variable stars in the cluster. At last count in 2005 there were 17 known variables plus another possible candidate. More recently, a renewed interest in NGC 4147 is surfacing because of recent claims that it is the result of a galactic merger with the Sagittarius dwarf spheroidal satellite galaxy. This image was captured from my home in a Bortle 6 zone with darkness readings of 18.9 magnitudes per square arc seconds and naked eye limiting magnitude of 5.5. The sky was clear but seeing was not that great. The humidity was about 80% during the 2.5 hours needed to capture the LRGB frames. There was no wind. NGC 2419 is a globular cluster in the constellation Lynx. It appears as a small globular cluster located at the outer edge of our galaxy. While it appears small and dim to us, it is actually very large and bright. At a distance of 295,000 light years its 4.1 arc minute size comes in at about 400 light years across. This is 3 times the size and 30 times the volume of the Omega Centauri cluster. This gives an estimated mass of 300-400 million solar masses, larger than a lot of dwarf galaxies. If NGC 2419 was a close as Omega Centauri it would appear as a magnitude 3 fuzz ball at 2 degrees in diameter. NGC 2419 does contain variable stars and as of 2011 there were 101 confirmed. Variable stars come in many classifications; Pulsating stars, Eruptive stars, Eclipsing Binaries, and Rotating Variables with some of these classifications have several sub classifications also. Some of the variable stars found in NGC 2419 are RR Lyrae, long period variables, eclipsing binary variables, a Population II Cepheid, and a few others. NGC 2419 also contains blue straggler stars. As of 2008 more than 230 blue straggler stars have been cataloged. Blue stragglers are older stars that are much hotter than the surrounding stars. This is unusual in globular clusters as all stars form at about the same time and therefore should be fairly uniform in age. One theory about blue straggler star formation says they are older stars that have merged together from gravitational interaction and as a result are hotter that the surrounding stars. Another possibility is the stripping of outer layers from the star from interaction with other stars. 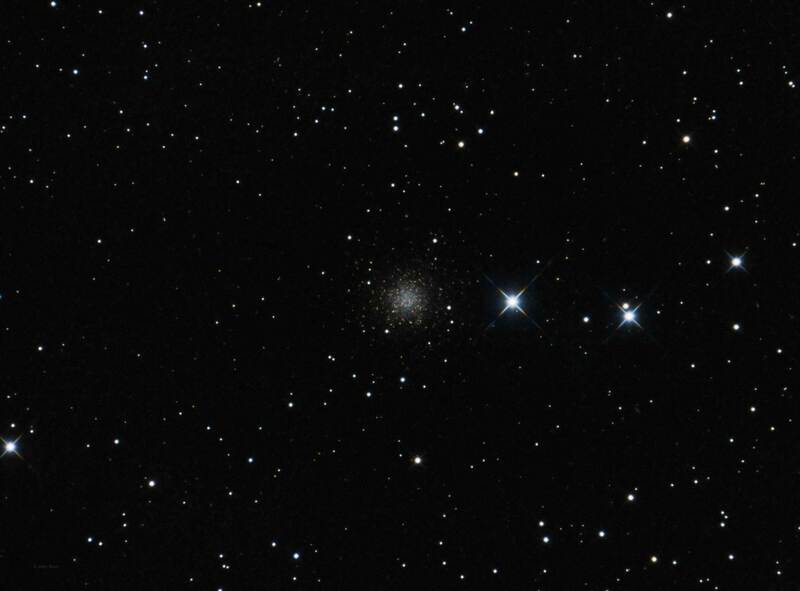 Messier 92 is a class IV globular cluster in the constellation Hercules. M92 is estimated at 14 billion years in age and thought to be the oldest globular cluster in the galaxy. This age estimate is partially based on the low metallicity counts in the stars of M92. Low metallicity indicates that the globular cluster was formed very early from gas and dust that was not yet enriched with metals. M92 has 24 variable stars as of July 2012. [Christine Clement’s Catalog of variable stars in M92] Of these 17 are classified as RR Lyrae type variables. The other 7 are type SXP which is short for SX Phoenicis, a type of variable star with low metallicity and very short periods. 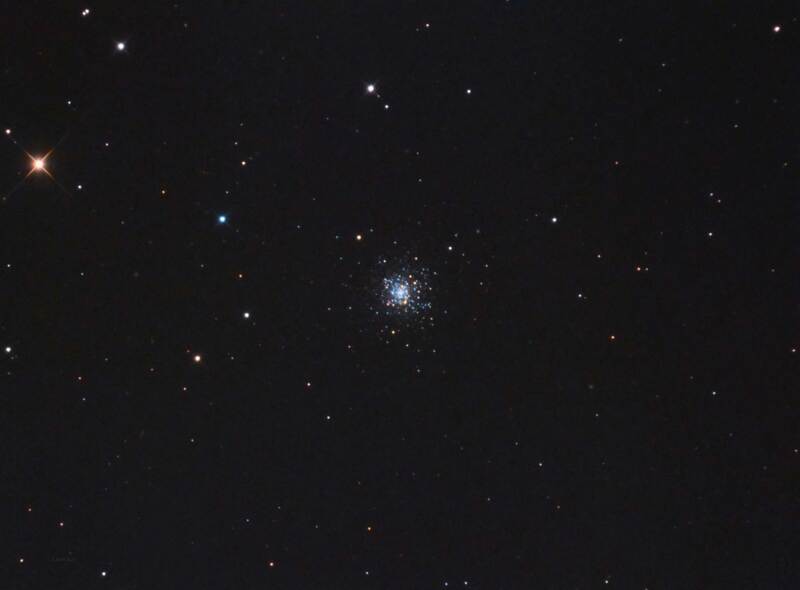 M92 also has blue straggler stars with the heaviest concentration in the center of the cluster. A blue straggler star is a young hot star that is thought to have formed from an interaction with another star. During this interaction, the stars shed material and the cores merge to form a new star. M92 will be within 1 degree of the North celestial pole in about 14,000 years. This will be the result of the Earths 25,772 year precession cycle. 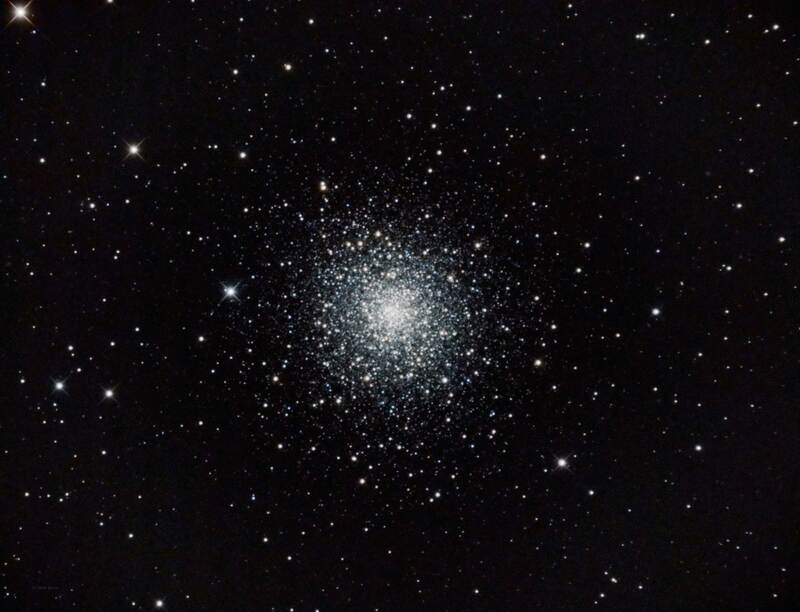 Messier 12 is a globular cluster in the constellation Ophiuchus. 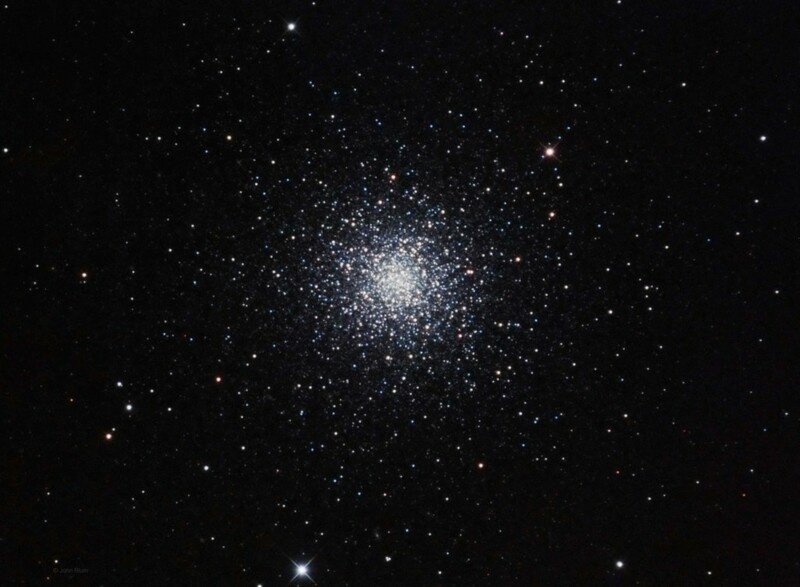 Like all globular clusters, M12 is very old at 13 billion years. 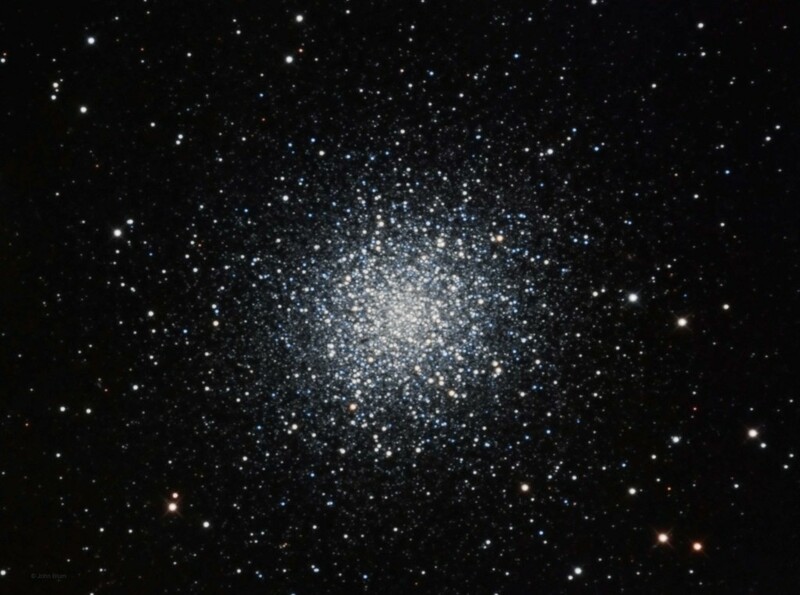 M12 contains about 200,000 stars but what is unusual about M12 is that it missing a lot of the low mass stars typically found in globular clusters. One explanation is the galactic orbit of M12 takes it closer to the galactic core than many other globular clusters. As M12 moves through the core area the lower mass stars are stripped away by the massive gravitational pull of the dense core area. This could explain the Class IX rating given to this cluster. The Class IX rating means that M12 has a loosely concentrated core area. M12 is home to variable stars, blues stragglers, and red giants. What is unusual is that M12 only has 13 variable stars which is a small quantity for globular clusters. M12 is also populated with blue stragglers which are younger hotter stars that have formed as a result of interaction with other older stars. The red giants are large cool stars that are at the end of their lifespan. 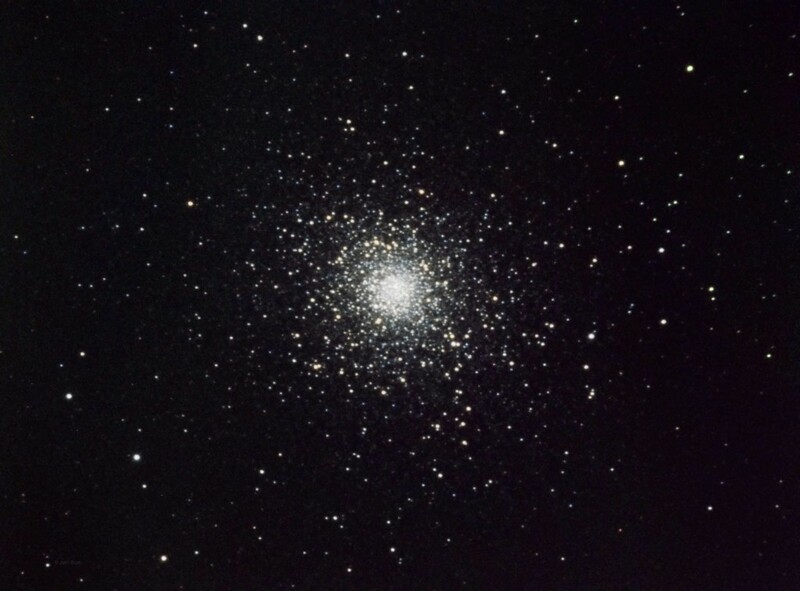 Messier 5 is a large globular cluster in the constellation Serpens. At 13 billion years old it is one of the older globular clusters. It is also fairly large at 23 arc minutes but the majority of the cluster extends out about 17 arc minutes. Like most globular clusters, the stars in M5 were formed at about the same time. The largest short lived stars went supernova early in the clusters life cycle and blew out the remaining gas and dust in the region effectively removing the material for future star formation. The remaining stars fell along the main sequence and were smaller and cooler. This cluster also has many RR Lyrae variable stars and a large amount of Blue Stragglers. The RR Lyrae variable star is a star that fluctuates in brightness over a regular period. To date, 97 RR Lyrae variables have been cataloged. The blue stragglers are stars that are bluer and hotter than the surrounding stars in the cluster. This should not happen in a globular cluster as all stars are formed at about the same time. One theory is two stars had an interaction where they lost outer layers and merged in to one newer hotter star. Another theory is that the two stars had an interaction where one’s outer layers were stripped donating this material to the other star. Globular clusters are rated according to the distribution of their stars. This rating system was formed by Harlow Shapley and Helen Sawyer Hogg and is known as the Shapley-Sawyer Concentration Class. The ratings use Roman Numerals starting at I and ending at XII. Roman numeral I is used for globular clusters with most of their mass at the core with little surrounding stars away from the core. Roman numeral XII is used for globular clusters with a very loose core with minimal structure. 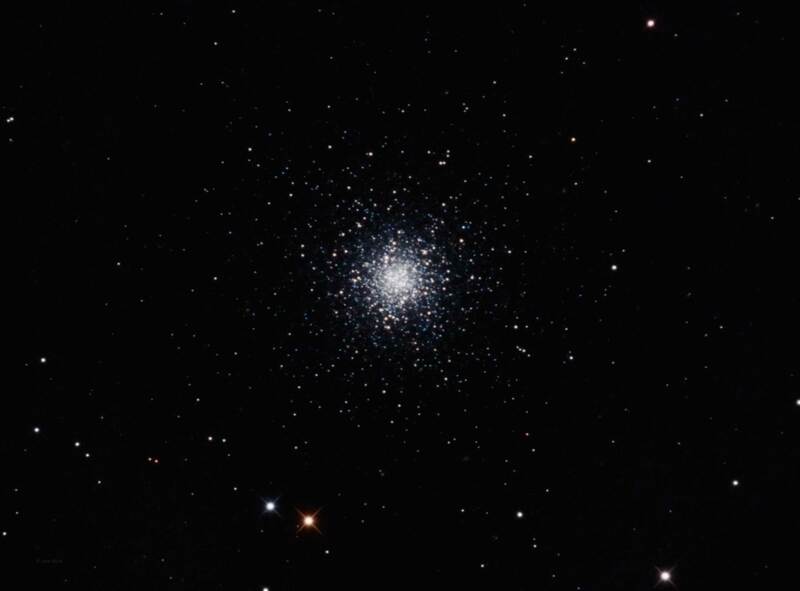 M5 is classified as a Class V globular cluster which describes the cluster as having intermediate concentrations of stars. Messier 53 is a class V globular cluster in the constellation Coma Berenices. At a distance of 58,000 light years its 13 arc minute diameter translates to about 220 light years in diameter. It is one of the furthest globular clusters from the galactic center at 60,000 light years. 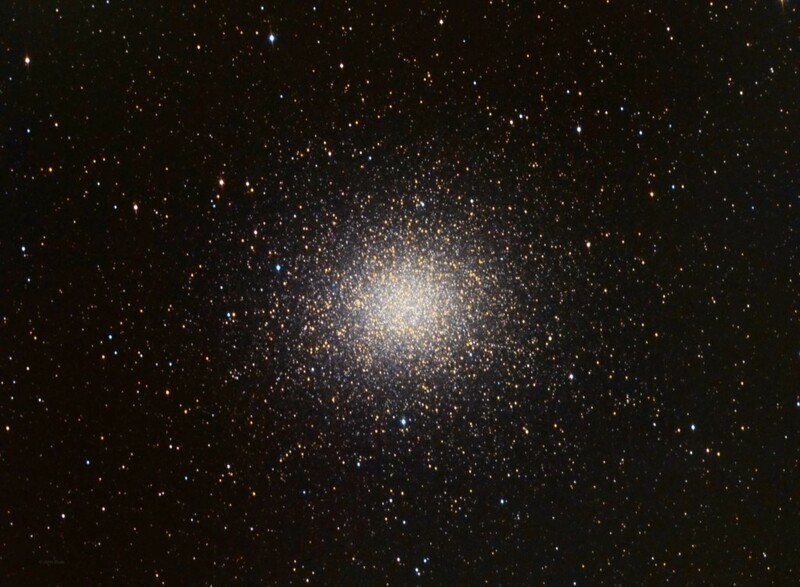 Like most globular clusters this cluster is populated with many older stars, RR Lyrae variables, and blue stragglers. All stars in globular clusters form at about the same time so they should be about the same age. The discovery of younger blue stars threw a wrench in to the conventional thinking. Why where there younger hotter stars in the cluster? One theory about blue stragglers is that they are stars that have been stripped of their outer layers through interaction with other stars leaving a hotter core. Another theory is that two stars have merged in to one giving the appearance of a younger hotter star. The RR Lyrae type variable stars are also a common feature in globular clusters and these variables typically have a short period. Named after the first discovered variable star of this type, RR Lyrae, these variable stars are about half the mass of our sun, older than our sun, and also hotter than our sun. The variation in brightness is due to the increase and decrease in size of the star as its outer layers pulsate. The variable star will be brightest at its smallest size and dimmest at its largest size. These periods can be timed with great accuracy. Messier 13 is a large Class V (medium star density) globular cluster in the constellation Hercules. This cluster contains over a million stars* and shows well in short exposure images. M13 is very old at 14 billion years but contains some blue straggler stars which indicate much younger stars. One theory about blue straggler stars formation says they are older stars that have merged together from gravitational interaction and as a result are hotter that the surrounding stars. Another possibility is the stripping of outer layers from the star from interaction with other stars. Like all globular clusters, the stars of M13 formed about the same time and are about the same age. We know this because many of the earliest stars of globular clusters were very large and had a very short lifespan. During their demise they went supernova and blew any remaining gas and dust out of the area thereby depriving the area of any materials for star formation. What is left after these first few million years is the smaller stars that fall in to the main sequence and these are what we see today. The star density in the core area is very dense. There are several hundred thousand stars within a 6 parsec area around the core. In contrast, the nearest star to our sun is 1.3 parsec away. Could you imagine what the day and night sky would look like from a star near the core of M13? It would be awesome!